Hillary Clinton's attendance at the 2014 steak fry, which brings together prominent Democratic leaders from the first-in-the-nation caucus state, is the most obvious political step for the former secretary of state and possible candidate for the 2016 Democratic presidential nomination. Other than campaigning for candidates with whom she has a personal relationship, Clinton has largely tried to stay out of politics since leaving the State Department in 2013. It has been over six years since Clinton visited Iowa. Her attendance at the event has been rumored by Clinton insiders for over a month. Harkin first organized the steak fry as a fundraiser 37 years ago and this will be his final event as host, as he is retiring from the Senate in January 2015. “Not only will this be my last Steak Fry, we’ll also need to rally our troops for outstanding, progressive Iowa champions on the ballot this Fall," Harkin said in a statement. "That’s why I couldn’t be happier than to share this special day with two such close friends. They have contributed so much good, inspiring leadership to this country for many years, and I am sure they will continue to do so in the years ahead." Clinton spokesman Nick Merrill said: "She’s looking forward to campaigning for her Democratic friends and colleagues and to helping the effort to move America forward, including a stop to see her old friend and colleague Senator Harkin to help raise money for important races in Iowa." The steak fry regularly draws big-name, national politicians and is seen as a required stop for any Democrat seeking the presidency. Vice President Joe Biden and then-San Antonio Mayor Julian Castro headlined the event last year and then-Sen. Barack Obama headlined the event in 2006, two years before he bested Clinton for the Democratic presidential nomination. 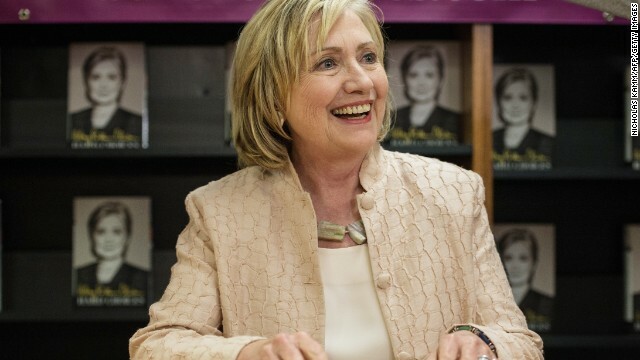 Since leaving the State Department in 2013, Clinton has become a regular on the speaking tour and published a memoir in June about her four years as secretary of state. Although widely seen as the frontrunner for the Democratic Party's presidential nomination in 2016, Clinton has tried to play coy about her aspirations. She has, however, used her book tour to tout her record at State and in the past months has become more open about the fact that she is considering running for president. Iowa has not always been friendly ground for Hillary Clinton. During the hard fought 2008 presidential caucus, Clinton finished a disappointing third behind then-Sens. Barack Obama and John Edwards with 29% of the vote. Obama won the caucus with 37.6%. In her memoir, "Hard Choices," Clinton wrote, "The night of the Iowa caucuses, when I placed third, was excruciating." In July, as Clinton toured the country as part of her memoir tour, an Iowa editorial board urged Clinton to spend more time in Iowa than she did in 2008. "Our hope, if you are really considering a 2016 run, is that you have learned from your experience and come to Iowa intent on having true conversations about what matters to our state and the fine people in it," the editorial board wrote. "We’d suggest sooner rather than later this time." PS: first woman president in USA history. A steak fried in butter until it has a crispy crust from a spice rub sounds delicious. Too bad I can't eat them, anymore. Well, not as much as I used to. Once or twice per year, compared to once or twice per week forty years ago. Amazing how someone who is, "so called broke" can still spend money like there is no tomorrow. I guess her broke and our broke means two different things. Kind of reminds me of her mouth, never quite sure what she is saying or meaning. If someone hasnt visited a place in 6 years. Seems to me that realy is not very important to them. Must be another opertunity for a free book give away. People need to look up definition of Narsisist.. Behavior section. Maybe you can convince Joni Ernst to show you a Pig Farm, where the real Pork resides. Dar, Hillary said they were broke when they left the White House. They had more debt than assets at the time, which is stressful for anyone at all. Mountains of legal fees is a scary thing, and by that standard, when you owe more than you have, you're broke. Hillary did not say she is broke now. Let's give this non-issue a rest. I'm sure you'll find something new to pick on her about soon. Welocme to Iowa, Madam President. Hope you enjoy that Iowa beef fried steak. Love that midwest beef. Oh sooo delicious! Hillary Clinton is not presidential material. Sen. Elizabeth Warren is without a doubt a better choice for president. Back to Arkansas. We need a woman president we can trust. Your record, on travel gate, white water, Bill's cheating, Libya, ACA, and giving into the pressure from Dem leaders during 2008 to drop out and let the worse president since Jimmy Carter win the WH. You should be ashamed. You might have learned your lesson, or just learnt how to lie better. Which ever, Dems want someone fresh and newer than you. It's not your age, it's your association to your past. Unfortunately, not a great track record. You would guarantee a GOP victory if you ran in 2016. Be a wonderful grandmother to your daughter's child. We love you. Your time has past. At this point, any democrat who can stand in shoe leather is a better choice than anyone the GOP can muster. Warren would be my choice too, but let's face it, there will be no choice one the GOP selects their next lunatic. I think that the Republicans will wind up selecting Rand Paul, who will be forced to pick an unelectable to be his VP. Maybe Hillary will visit the Maytag Manufacturing Plant. Oh, sorry Maytag moved to Mexico.